The Sony KDL-70R550A 70 inch is Sony's largest size LED TV without jumping to its 84” 4K UHD. This model is possibly a replacement for the EX640 series from last year though with many changes. It's the 3rd tier quality and feature-wise in Sony's 2013 and early 2014 lineup. For starters, this is the first year Sony has produced passive 3D TVs, which with the KDL70R550A comes with 4 pairs of 3D glasses. There is built in Wifi, Smart TV options, USB playback. The TV is also RVU ready for DirecTV and MHL ready for screen mirroring NFC smart devices. It has a more economical matte screen finish than the top models. One note about black level depth on the KDL-70R550A is that they look jet black on the top and bottom bars in a 16:9 format mode when directly viewed front and center. However colors can be a little more washed out on the picture itself due in part to the anti reflective coating on the screen of the R550A. Colors rendition on these new Sony TVs is exceptional and not over-saturated. The fact that the TVs calibrate easily to D6500K speaks to their color accuracy. The backlight is extremely powerful and can overpower color in the R550A so keep it moderated. Sometimes dark shadow detail could be better in the KDL-70R550A as the screen filter (matte screen) on this TV causes a hazy appearance with some programming on the screen. One quick fix is to turn up the Brightness setting some. This will cause better definition in dark areas but at the expense of less penetrating blacks. Color rendition is realistic and not over saturated and the TV calibrated near D6500K even though there is only a 2 point white balance control setting on this TV. The custom setting is set fairly close to D65 from the start. There are also only 3 choices of picture modes and no gaming mode on the R550A. Sony generally has great processors in their TVs. The video engines in the R550A does a competent job but there is definitely a significant improvement in the higher end Sony TV lines. The difference results in more motion artifacts in general, less defined lines, and more background noise in the R550A. Vivid: Blows up the picture with too much blue, image enhancement and all kinds of false features. Backlight and contrast are set at peak settings. Custom: Comes set near D6500 for a cinematic, film like picture. One of the most natural picture mode settings we've found. This feature working in conjunction with the 120Hz panel can distort the natural background blur in the picture somewhat in movies or film-based content so use with care. It's great for sports programming though. Options within the setting are: Clear, Clear Plus, Standard, Smooth, Impulse. We recommend turning it off for movies, and using the Standard or Smooth setting for other programming. Sony's and other manufacturers foray into less expensive passive 3D is proving successful. We like it better than the more complicated and controversial active 3D TVs on the market. The glasses are cheap, light and universal across brands and they produce no flicker even with oncoming light. But what we like best is the 3D picture quality with passive 3D on the R55A. Depth perception is great as is color richness and the involvement of the 3D image. On a TV this large, you'll love the 3D performance. Though the picture darkens a good bit with 3D content it adds lots of depth perception to this otherwise flat 2D TV picture. This is always an issue with edge-lit LED TVs and especially those with a matte screen finish. With the backlight tweaked way up, it's not bad with the R550A as the brightness helps with off angle viewing contrast. But at normal levels (which we recommend) you will see contrast and colors fade off center at around 30 degrees. 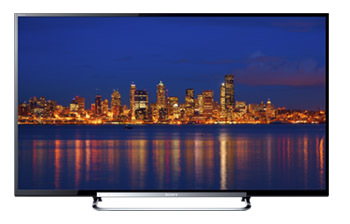 The R550A is an average LED TV performer in this category. Color rendition also changes slightly from side angles. The inbuilt Clear Resolution Enhancer technology does help some, but not enough. Overall, we were not too impressed by the SEN (Sony Entertainment NEtwork). Internet choices are fairly easy to access and include Netflix®, Pandora®, HuluPlus™, Amazon Instant Video, YouTube™, Slacker® Internet Radio, Crackle and social networking through Facebook and Twitter as well as others like Yahoo! Broadcast Interactivity Widgets. This new platform allows one-click access to TV Apps which are related to the content you are watching on the TV. In other words, it's a convenient way for Sony to market their Apps to you if you are so inclined to use the feature. On the other hand, it does make it easy for you to know which Apps you might like. As far as additional and free Apps goes I really did not see a lot of value. The inbuilt Ambient light sensor is there for your use if you want it but may be turned off through the menu system. It introduces a slight amount of flicker that the most pure picture-hearted will not want to tolerate, plus it can dim the picture at unexpected moments. The gloss black plastic bezel frame isnt bad - it's certainly nothing special but at least it's a half inch in width. I like a matte frame better. The chrome strip on the bottom of the bezel is distracting and not attractive. Depth is pretty hefty at over 3.3 inches. A very good comparison for the KDL-70R550A is Sharp line with which Sony is trying to take some market share. The 70R550A sells for around $2498 putting it very nicely in a value-plus area in the price per square inch category. It has a reasonable feature set to go along with the size and we particularly like the passive 3D. The Sharp LC-70LE757U and Samsung UN65F6400 are good comparisons.